That's right, those are the five Foretellers. They are apparently engaged in a conversation, or at least a meeting, with someone whose identity is concealed under that iconic black coat. The player, while observing the meeting (albeit only for a short period of time), is then abruptly engulfed by some dark energy, and that's when he wakes up from his dream. The conversation that takes place shortly afterward is another interesting facet of this story update. The player goes to get some rest again and is soon out of commission. Chirithy notices someone - something - off the screen. Chirithy: Are you the one who interfered? It turns out that there is another Chirithy standing just outside the window of the player's room. Window Chirithy: Did you show him the dream? What are you trying to achieve? Room Chirithy: The exact opposite of what you are doing. Window Chirithy: Then this means we are enemies now. The Chirithy beyond the window blends into the dark of night, disappearing from view. The questions that remain, therefore, are a few. What is it that the player's - our - Chirity is trying to tell us? Who is the person in the black coat? How do the Foretellers relate to him / her? What exactly is the other Chirithy trying to do? Which Chirithy is to be trusted? However, the ultimate question is of course "What do you think of all this?" Well then, fire away and let your theories and opinions be heard! Taochan and Chaser for the information regarding the dream scene. Kazr10 for the dialogue translation. I hope it's the missing apprentice. Oh gosh the other Chirithy again. Lol the black coat. Kando, Nomura. Plz. Interesting. So it is a players dream. I wonder when that event took place. Also, this raises a question about the age of the iconic black Org XIII cloaks. Maybe the have been around far longer, and Xehanort wasnt the first who used them. Or could the person wearing it be a time traveler? Agh, Nomura! You are making my curiosity grow even stronger. Why did our Chirithy show us this dream? Who does the other Chirithy belong to? Why do they have opposite intentions? Who's the guy in the black coat? What is he and the Foretellers talking about? Is the dream showing us past or current events? The problem with Chi is the existence of Chirithy. 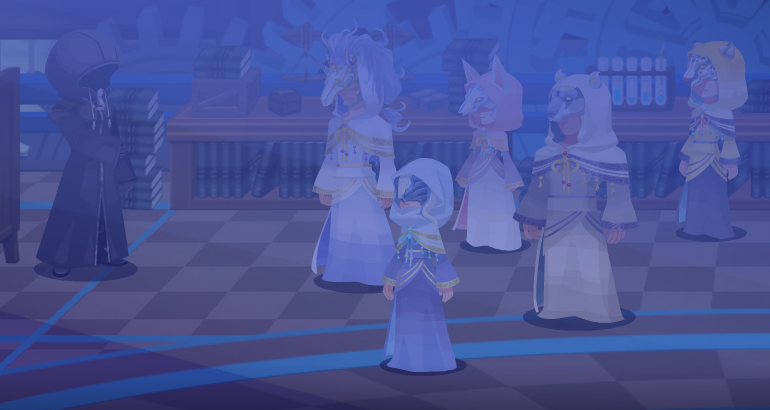 Before we learn about 2.5's secret movie, we assumed that Chi is a fairytale rendition of the ancient Keyblade War and the only things canon are the Foretellers, Book of Prophecies, and Chirithy itself (probably). But the first contradiction occurred in the 1st Anniversary Event, when it is revealed that Chirithy knows who Mickey is. If Chi takes place in the ancient past, how is this possible? Plus there is the scene with Mickey and a black coat figure as well. Then the secret movie affirmed that the card system Chi used is created from the Book of Prophecies. And also brings about the possibility that Chi itself is a data world. Think of it as a simulation like data Twilight Town. Chi could be a simulation of the Keyblade War instead of a fairytale based on past events. So here's a problem. If Chi happens in the past, how do you explain Mickey and gang? Treating it as non-canon will void the scene between him and the black coat figure. If Chi is a data world, maybe Chirithy's role is an administrator or something? Like either Namine & DiZ in KH2 or Data Riku? I think that knowing solving Chirithy's identity and purpose is the most important thing to learn the truth in Chi. If he is really canon. What we know so far is that he is created by a master, there is 1 Chirithy per player and is tasked to lead the players in collecting light. Also if the player dies, so does his Chirithy (although we learn this through a death of a NPC who is said to be another player, so it may be a lie). The latest mission in Chi is about Chirithy discovering a new Heartless (Minute Bomb, emblem) and asked the players to defeat it. After the mission, he told the player to rest for the day and we got the above scene. The dream is incomplete by the way. Maybe Chi isn't the past. With the possibility of Chi being a data world...Chi's existence could be Mickey's attempt in finding out something about the Keyblade War. Collecting Lux is collect data, the Chirithies monitor the data keyblade wielders (the players.) This would explain why characters who shouldn't be there are and why Chirithy knows Mickey. Augh, the dreeeeeeeeam! I must know all of it! Why u not want us to see it, other Chirithy?! Whhhhhhy?! Well, the obvious answer is the sixth apprentice. But Data-Riku also wears this coat, so if χ[chi] is a data world like Kazr said, then... perhaps this black coat plays a larger role than that. The presence of Mickey and co. in the anniversary event still has me puzzled. The Book of Prophecies can take things from the future, so maybe they were brought in that way? It was a crash landing, so however they got there, it wasn't on purpose. But if it's a simulation, then they could have simply been... simulated. Why are Chirithy tied to the Player? To guide them, yeah, but I feel like there's more to it than that. The master that created Chirithy is still perhaps the most enigmatic piece of the puzzle. I want to know more about him. Chirithy: (to player) What's wrong? You seemed to have a nightmare. You should try sleeping again. Chirithy: Are you the one interfering? Window Chirithy: Did you show him / her the dream? What are you trying to do? Window Chirithy: Then I guess that we are enemies now. The questions that remain, therefore, are a few. What is it that the player's - our - Chirity is trying to tell us? Who is the person in the black coat? How do the Foretellers relate to him / her? What exactly is the other Chirithy trying to do? Which Chirithy is to be trusted? Is it possible this could play an important part in Kingdom Hearts III? Taochan & Chaser for the information regarding the dream scene, and Kazr1 for the dialogue translation. One thing that I worry is that if this is a data world, then Maleficent or others might be interfering. It would be a shame to establish Maleficent as interested in the Data World and then not use her once the Data Worlds become important! But I can't picture her wearing a black cloak, and that's certainly not Pete under there... But it could explain the evil Chirithys! But maybe I'm going too far afield. With or without it being a Data World, there are a few other guesses that have occurred to me overnight. The other Chirithy might not be doing bad on purpose? The Keyblade Wielders were all misguided into fighting over the Lux and destroying the world. If having their player immersed in darkness really does kill the Chirithy, they have no reason to encourage it unless they think it's for the best. Your Chirithy might be trying to show you that fighting over the Lux is pointless (Look! The Foretellers are all conspiring with this stranger! ), while the others might be trying to reinforce the status quo? Of course, they might be working for a bad guy after all. Black Cloak might be keeping the Foretellers convinced through simple charisma, but he's still got to do something about their armies (and that's what we are: armies). In the Walkthrough thread I mentioned that Black Cloak might have his own Chirithy working to corrupt us, I should mention that here, too. To Kazr's point about Chirithy possibly not being historical, I think that's possible. If this is a data world, I think there may still have been one historical Chirithy (a cat owned by the Master), while the rest are probably data administrators. Putting aside the cats and turning to the Unknown... Assuming the Black Cloak isn't an external element - which is quite possible - I feel it has to be the Sixth Foreteller. We're just out of characters otherwise. It's not a very detailed theory, it just feels like the only option. First, Happy Thanksgiving to all those celebrating it today! Here's hoping you're all happy, and with friends and family. About the dream, i'm convinced that Black Cloak is the missing apprentice, whom for whatever reason is off doing his or her own thing, perhaps relating to the fact that only he/she did not receive a book of prophecy. But the other Chirithy is much harder to nail down. Is it Cloak's? Is it one of the Foreteller's, possibly even our own? Why is it so interested in us specifically, when there's scores of wielders among the Unions? It implies that the little guy cannot come out and say it directly, for whatever reason. And I think that's what worries me most. So are we finally gonna start getting the keyblade war in this game about the KBW? 'cuz it sure has taken its sweet time getting there. Difficulties finding a suitable service replacement for Yahoo Games Japan. PC browser social games aren't exactly popular around here. I really admit that I should read up on Chi more than I do. The few times I have there's been something interesting like this and now I hear mixed feelings if its canon now? However its still a pain considering I can't play it lol. How much story is there so far? I'd refer to this thread for help because I think you are likely to see more responses in there. Well, Data Riku isn't that tall so I think we can probably eliminate him. The mysterious chi guy is about as tall as Ursus, who is pretty damn tall. But what other data beings could be wearing a coat? Thanks Spockanort, as to the black cloaked friend why not a data Young Xehanort? Although he wasn't seen in Re:Coded, we did see data Ansem SoD in his brown cloak talking to data Riku. He could have gone back in "time" (Is there back in time for events in a journal?) and gave the powers to Young Xehanort. Either that or the real Young Xehanort found his way there either through the data worlds or through time, whether chi is set in data or the past. He could match the mysterious figure's physical appearance. It's my two cents anyway. Oh as a follow up because I forgot to add why; Young Xehanort is there to find one of the 13 darkesses perhaps. Other theory was Xemnas based on the fact that he has an entry in the journal for kh final mix. Plus he wore his hood of his cloak the entire fight and was truly mysterious like our chi pal. Even though he wasn't in recoded, he was in that journal right? Okay now I'll leave it alone lol. Well, Data Riku isn't that tall so I think we can probably eliminate him. I wasn't really trying to say it could be Data-Riku, just drawing a comparison. Data-Riku is effectively the embodiment of the Journal within the data world extracted from the Journal. And he wears the black coat. So, if χ[chi] is a data world, my idea is that perhaps this black coat is in a similar role. Data-Riku guided Data-Sora in fixing the bugs, so in this role, how could this black coat be guiding the Foretellers? I'm pulling a lot of parallels between χ[chi] and Re:coded without much concrete evidence, but I feel like there is a very real connection here. Or, there could be one.